Pallets are for much more than just shipping, nowadays. They are much more commonplace and can be used for a vast variety of uses. 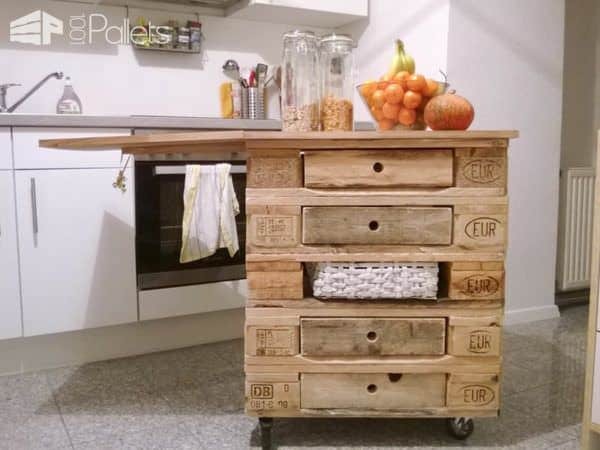 You can either use new or second-hand pallets to build various furnishings. Many people have used them to build unique and attractive indoor furniture; you can build yours as well. You don’t need to spend a lot of money on everything in your home; pallet furnishings look great with products you do have to buy, such as vinyl wood plank flooring NJ. Building a beautiful home is a process, and you need to get everything correctly synced, including shining faucet fixtures, kitchen sinks, and countertops. 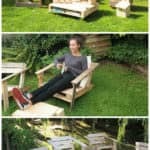 In the light of this, we present you five DIY pallet furniture pieces made from reclaimed wood - namely, pallets - that will give your home a unique and attractive look. Would you have thought that a simple wood pallet can add grace to your living room? Well, it surely can do so. It’s quite easy to build a coffee table using wood pallets. All you need to do is to stack and screw two pallets on top of each other. Then, you can add some casters to the bottom. You can also build a similar coffee table with a little or more rusticity to complement your design style. However, this will largely depend on the kind of pallets you use. 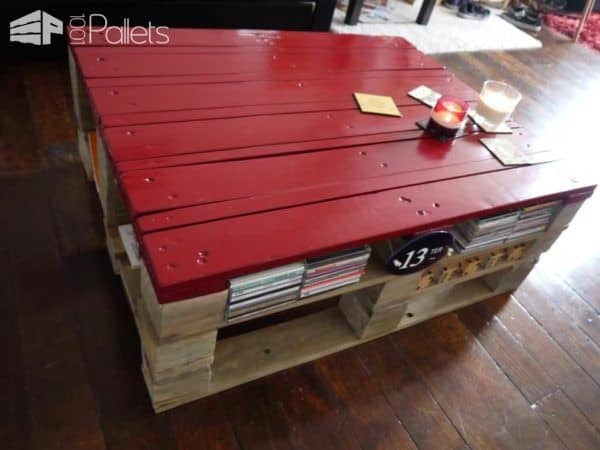 One of the best things about pallet a coffee table is that you get a practical shelf to hold items such as magazines, books, etc. 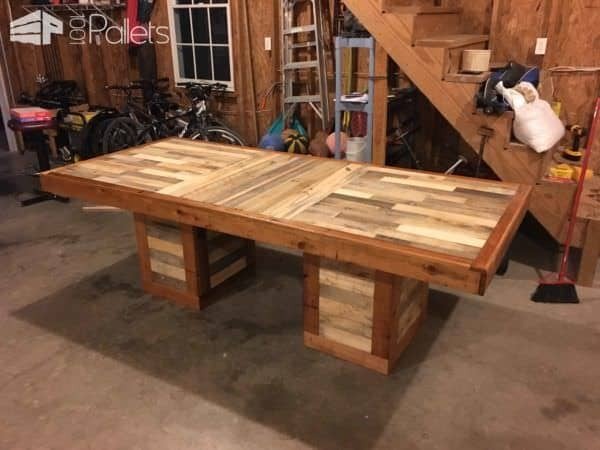 With four wood pallets, you can build an original dining table. The table presents a simple and rustic look. You can use it both outdoors and indoors. Moreover, you can customize it to size, as well as design. When it comes to building a dining table, it is advisable to use pallets that are not chemically treated. Consider finishing your table off with wax, oil, or a polyurethane deck; this ensures that your furniture is weatherproof and long-lasting. You don’t have to spend a lot of money to build a fancy kitchen island. 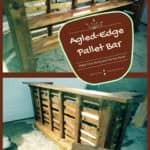 Wood pallets can still do a wonderful job. What will you need? Just cut the pallets to the desired size, nail them together, and fix a top. Then, paint your kitchen island in a color that blends well with your kitchen. You can choose any Kitchen island design that works for you. 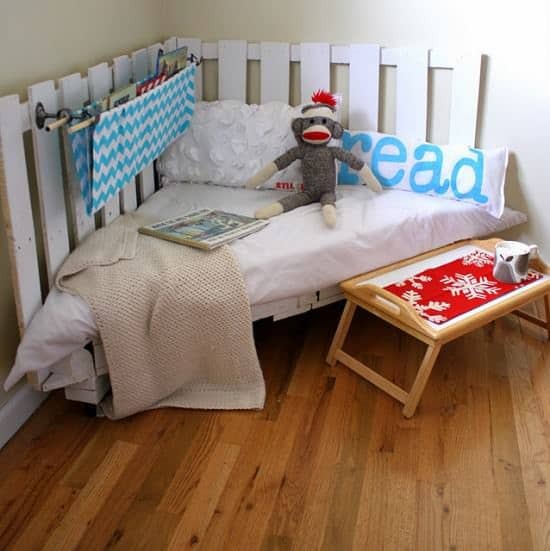 Do your children at times need a quiet place where they can go and relax to read a book? You can create the place yourself. Two pallets and some power tools will do the trick. Simply cut the pallets in your desired shape. Then, fasten them before adding some back structure. Lastly, add some cushion and comfortable pillows. Do you need an extra bed? You don’t have to make a trip to the furniture shop. 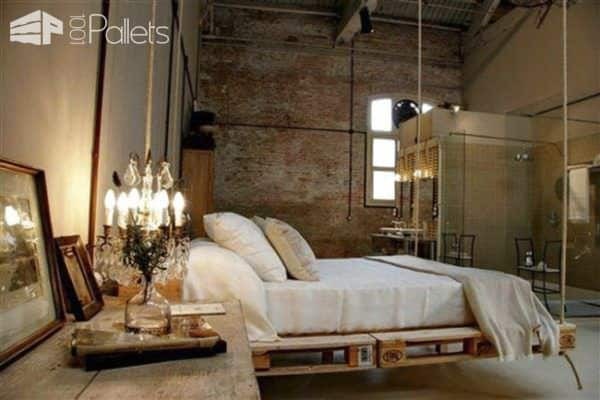 All you need is a couple of wood pallets to turn into bed. One of the advantages of pallet bed is that you have the freedom to choose the most comfortable height for you. You can also create space for your favorite items, like books. Pallets can be used to build a lot of things. They’re no longer simple and unsightly. Instead, they can be simple, but unique and fascinating household furniture. Today, we went over a variety of furniture uses in which we hope inspired you to try one or more of following pallet designs to help achieve your decorative dreams. 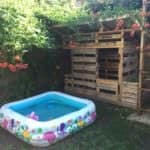 Diy Video Tutorial: Easy Pallet Beach Seat!